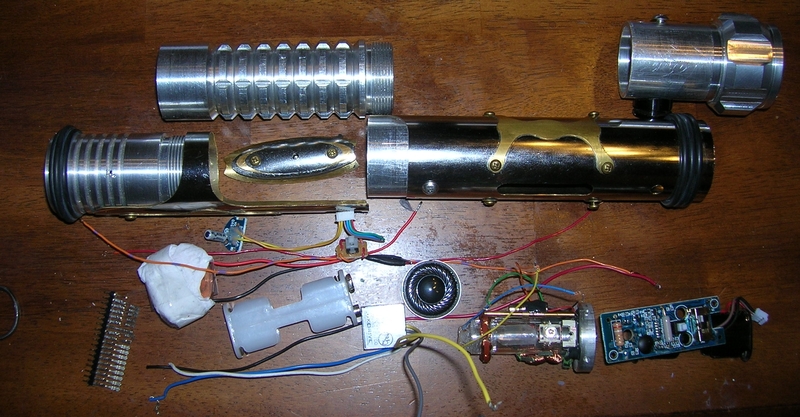 One “Star Wars” fan shares best practices for a DIY lightsaber. Part of becoming a true fighter in the Star Wars universe—be it a Jedi or a Sith Lord—is constructing a lightsaber that is distinctly yours. With that in mind, Science Friday looked into one DIY approach, and got some best practice tips from its designer. The project is a quick lesson in building electronics, and provides the opportunity to be creative with your end product. 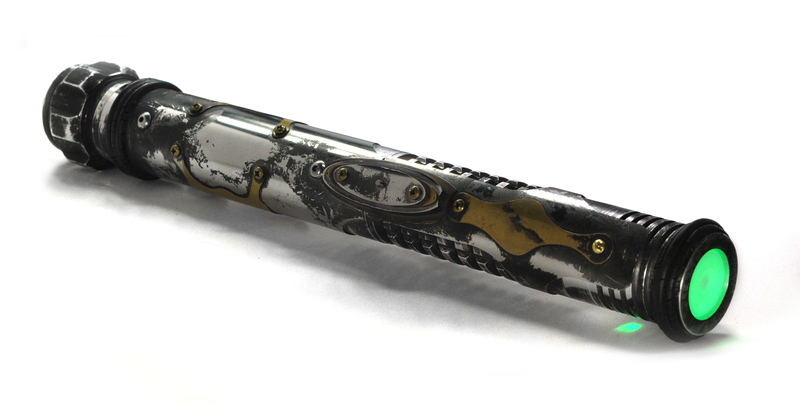 “It’s kind of the iconic science fiction weapon,” says Vince Estacio, a machinist and hobbyist based in Austin, Texas, of the lightsaber. He first started thinking about designing his own in 1999. Store-bought sabers just weren’t cutting it—“if you bang the weapons or the toys against each other, or against a surface hard enough, the light will go out and it will break”—and he knew he had the engineering expertise to hack one for himself. After a lot of experimentation, Estacio narrowed down a stepwise process and posted the instructions online several years ago, as a feasible DIY guide. He says that since first posting his guide, the technology and materials have become more available and commonplace, making the overall project even easier than when he tackled it. For instance, his recommended light source—LEDs—are more widely obtainable, and certain specialized retailers now sell pre-fabricated materials such as the hilt and customized circuit boards that can eliminate time-consuming tasks like soldering. Once the materials are acquired, the project should only take someone about eight hours to finish (though experienced DIYers might do it in two). “A determined 10-year-old” (with some adult supervision) could do this, says Estacio. 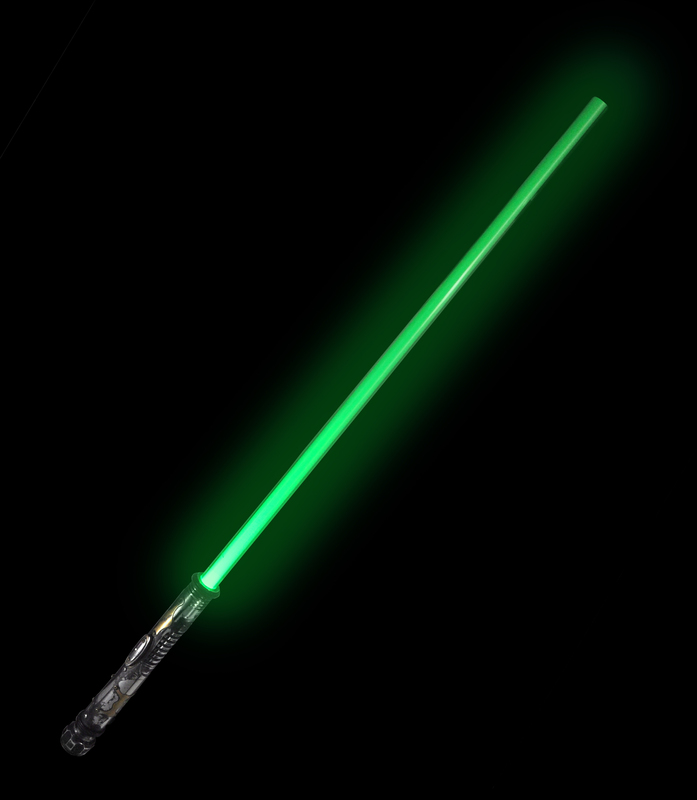 The first step in lightsaber-building is the most fun: choosing which color you want your blade to glow. The choice is crucial not only to your allegiances, but because each of the LED colors (there’s a wide range, including blue, red, purple, and green) comes with its own current and voltage requirements (see an example of the breakdowns here), which need to be taken into account when connecting the light to a circuit board. Look for one to three high-powered 1-watt LEDs, and also get an optical lens that’ll focus the light. Next, you’ll have to find your sound source—hearing the whooshes and the crackles of the saber make all the difference in the final product, says Estacio. Online retailers sell parts that can provide approximations of the Star Wars sounds, or you could buy a retail lightsaber and take it apart to commandeer its sound board and speakers, he suggests. If you’re ambitious, you could record your own sounds or music and program that into the circuit board that you’ll wire in with everything else. Your saber will also need a power source. When he was working on early designs, Estacio used AA batteries, but found that they would die after only about 20 minutes of use—no respectable Jedi would stand for that. He now recommends using a 18650 lithium-ion battery, which is about the size of a thumb and should be enough to power the lightsaber for about an hour or two, depending on the current and voltage requirements associated with the LED and the number of LEDs you use. You’ll also need a resistor or a BuckPuck to control the current running through the LED. All of these elements—the LEDs, speakers, batteries, plus the on/off switch—will be wired to a circuit board, such as this one. Then there’s the hilt, where the saber’s electronics are stored. You can make your own by purchasing a chrome sink tube (1.5 inches in diameter) at a hardware store, or get a prefabricated hilt from a specialized retailer like The Custom Saber Shop. Make sure everything fits inside the hilt and functions correctly before attaching the blade. Estacio recommends getting a polycarbonate tube for the blade, because it’s shatter-resistant. The tube should be about 40 inches (or 1 meter) and will also require an end cap (so the blade doesn’t look hollow), as well as refraction film. This film is scored with microscopic grooves “so when the light shoots from the bottom of the tube, the sheet catches the light and disperses it sideways,” says Estacio. The film must be purchased from a specialty hobby store (look for one that sells lightsaber parts), but it’s a crucial component. Roll the film up so that it aligns with the inside of the tube before you attach the tube to the hilt. Estacio stresses that the materials will vary depending on where you obtain them, which makes each lightsaber project distinctive. But to ensure that your personalized saber will function in battle, understanding the electronics is key, he says. See Estacio’s detailed Instructables guide here, and add your own creative flair. May the force be with you!